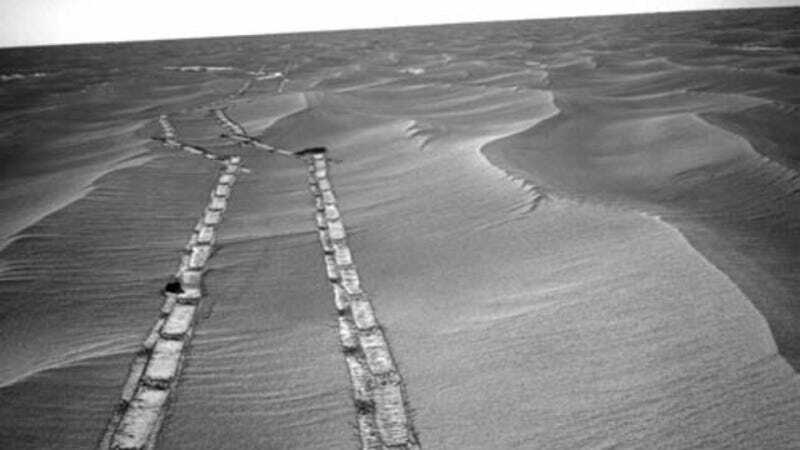 Things can be pretty slow-going on the red planet for NASA's Mars rover Opportunity. Since January of 2004, the solar-powered Opportunity has been chugging along the planet's surface at a leisurely pace of 60 centimeters an hour, but there's exciting news on the horizon. Or rather, its horizon. NASA's Jet Propulsion Laboratory has reported that Opportunity should reach its next long-term target, the rim of Mars's massive Endeavour crater, by sometime tonight. There, it will examine ancient Martian rocks, searching for any signs that life once existed on the planet. Opportunity is headed for a site on the western rim of the crater called "Spirit Point" (named after NASA's Spirit rover, which NASA lost contact with in March of 2010, and is identical in design to Opportunity). The image below was snapped by Opportunity's onboard panoramic camera, and gives us a view of the rim from just over 300 feet away. Endeavour offers the setting for plenty of productive work by Opportunity. The crater is 14 miles (22 kilometers) in diameter — more than 20 times wider than Victoria crater, which Opportunity examined for two years. Orbital observations indicate that the ridges along its western rim expose rock outcrops older than any Opportunity has seen so far. Spirit Point is at the southern tip of one of those ridges, "Cape York," on the western side of Endeavour. Back in 2009, the Mars Reconnaissance Orbiter (MRO) discovered that the older, clay-bearing rocks along Endeavour's rim represented a totally new rock-type — one that could give us a glimpse of life (or lack thereof) on ancient Mars. "The clays [we found] are not only indicative of abundant water, but also a watery environment more suitable for life," said Steve Squyres, professor of astronomy at Cornell University and the principal investigator for the science payload on NASA's Mars Exploration Rovers. Squyres and his colleagues believe this new rock-type may have once been more hospitable to life than any of the others encountered over the course Opportunity's 7-year tenure on the surface of Mars. Opportunity has made pit stops at various points of interest on Mars since it landed there in January of 2004. By expanding the crater image above, you can track where Opportunity has driven in the last seven years, and get a sense of how enormous Endeavour crater is.